that desire in all that I am doing. And the fiery courage of Pentecost. In the spiritual life we keep our practices, spend time in prayer, seek God in all things, and yet at some point even all this is not enough – and we are asked to become fire. Becoming fire means letting our passion for life and beauty ignite us in the world. It means, as St. Ignatius of Loyola wisely said, that we are called to set the whole world on fire with our passion for God. (Paintner, water, wind, earth & fire, p. 60) Consider the readings today within the context of becoming fire. How often do we get stuck in a situation and can’t see our way out? Sometimes we make decisions and dig our heels in despite new information, or despite the nagging that maybe we should be more open (A disagreement with a friend? A work decision? A long-time family rift?). It is in those moments that the fire of Spirit could burn within you, and be trans-formative. Paul tells us to “Offer our bodies to God.” This is very different from the Greek culture/theology that saw the body as only a prison-house, something to be despised and even shame-filled. But Paul reminds us that Christians believe that our bodies, our very real selves, belong to God. Our body is the temple of the Holy Spirit. The Incarnation assures us that God did not ‘stand apart’ from our bodies, but in our very flesh God came to show us his presence and love. Paul is telling them and us that it is the everyday ‘bodily’ activities of ordinary work in a shop or shipyard, factory or office that we are to offer to God as worship. In fact, the word used for worship is latreia, a noun form of the verb that means to labor or work for hire. It is not slavery, but the voluntary undertaking of work, a livelihood– that to which a person gives his life. So it is used in the Bible to mean the service or worship of God. In other words, Paul is saying that true worship is the offering of everyday life to God. This demands a transformation of body and mind; we must undergo a change. Our self-centered minds must become Christ-centered. We should not try to match our lives to all the fashions and interests of the world. We are not to be chameleons, but Christians. From the inside out, we must take on the mind and heart of Christ, being the Body of Christ in the world – the ‘job description’ for a Christian. Christian ethics is not so much a code, as it is a person…(William Barclay, Romans, 155-158) What does this kindle in you? To deny oneself is a phrase that has very Semitic origins. It is an idiom that means to ‘love less’ or to ‘give lower priority to’ oneself, meaning that we are to commit ourselves totally to God. It can be a dangerous phrase if taken out of context or given a negative meaning that implies that one is to subordinate oneself to others in a way that is not life-giving in a true and healthy sense. What Matthew is trying to say is that as children of God, we are to subordinate ourselves to God; it is in a way a celebration of this ownership by God. Christians are to be mutually subordinate to one another – not oppressed or oppressors. Embracing one’s cross means that we ‘put up with’ and accept whatever difficulties and shame come our way because we are trying to follow Jesus. Jesus’ death on a cross was a shameful death, yet he did not turn away from God’s way of love and truth. To follow Jesus may mean persecution or ridicule or hostility or other difficulties (like it did for Matthew’s community). These we must accept knowing with Paul that all is loss compared with “the supreme good of knowing Christ Jesus my Lord. For his sake I have accepted the loss of all things and I consider them so much rubbish, that I may gain Christ and be found in him . . . to know him and the power of his resurrection.” See Philippians 3:8b-11. (Mary Birmingham, Word & Worship Workbook for Year A, 496) What meaning (and questions) do you find in all this? Jesus saves – that is the message. Jesus saves US. That is the fire burning. That is what can lift us up and keep us on the path. Pierre Teilhard de Chardin said, “Some day, after we have mastered the winds, the waves, the tides, and gravity, we shall harness the energies of love. Then, for a second time in the history of the world, we will have discovered fire.” The fire grows as we help one another on our paths. Do we allow our eyes to meet and spark a connection or we turn away? What inner work will help ignite the fire of love? To make room for your light to fill me. It was frustrating to Paul that the people he loved, including Gentile converts, could not see what was so clear to him: that Jesus is Messiah and Savior of the world. He tried to understand, but there was no explanation. He finally decided to accept and trust God’s will (Birmingham, W&W, p. 488). Consider how this might ring true in your life – a loved one doesn’t understand a deep truth that you believe in. What do you do? Do you trust and hand it over to God? It is only Matthew’s gospel that has the section on Simon as Peter, the ‘rock,’ and the giving of the keys of the kingdom along with the ‘binding and loosening.’ He also is the only one to use the word church here. He uses it again in 18: 17-18 when the binding and loosening is given to the whole community. Later theology with its profound experience of the Risen Christ is certainly reflected in this passage. Yet, it also reflects the ‘Mediterranean mind’ of Jesus’ culture which was much more oriented toward the ‘community’ than we are. It would be, for instance, very common for someone to care about what others think about them. Jesus, like all the other humans of his time and culture, would value such feedback. And, in Jesus’ case, it might have been even more important because he did not fit any of the usual stereotypes. Jesus was not just the usual ‘person from Nazareth’ or the common artisan or stone worker’s son. (The Cultural World of Jesus, Cycle A, John Pilch, 127+) We are seeing the humanity of Jesus. Authority – the focus of this week’s readings – is today about the power to enforce laws or to judge or determine what is right or true. An accepted source of expert information is also called an authority. Our English word is rooted in the Latin word auctorem or autor, which means enlarger, founder, or, more literally, one who causes to grow. Thus, it could be inferred that those on whom authority has been conferred are vested with the power and responsibility to help others to grow. This authority can either be used rightly or it can be abused. “His heart was moved with pity.” Reading of Jesus’ reaction to the crowd that had gathered around him right before the miracle of the loaves and fish, I began wondering what ever happened to the word pity. It is certainly not a positive word these days. People say they don’t want to be pitied. Usually when someone says I pity you, it is not a warm thing. Did Mr. T in the eighties completely ruin the term by saying, “I pity the fool?” Yet, it was an emotion that Jesus had more than once and so it must be something worthy of understanding and imitating. I love this story. 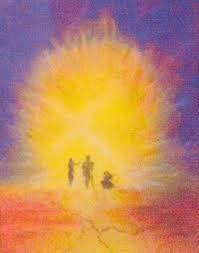 Jesus takes Peter, James and John to the mountain and becomes transfigured in light. Moses and Elijah join him and they start chatting (What are they chatting about anyway? Long time no see?). Peter is floored by the whole thing. He doesn’t want it to end. “Lord, it is good that we are here.” He wants to set up tents for everyone and just stay. Being summer and time for vacations, can’t you identify with that feeling? Getting away from home, experiencing new things and seeing beautiful places…it makes you feel like you don’t want it to end. It is good to be there. You want it to last. You don’t want to go back to the job, the chaos, the stuff of the every day. You can hear it in Peter’s voice: Can’t we just stay? Peter was still going on and on when God decides to interrupt. God enters in, expresses love for Jesus and says they should listen to him. Isn’t it interesting that when they are so happy and feeling so good that God shows up to their Transfiguration party? Of course, God is a part of that joy and goodness. God wouldn’t want to be anywhere else! God reveals God’s self in those moments. God causes those moments. And God strengthens us in those moments. Because, we always have to go back. Vacations end (spoil alert), and we have to go back down the mountain. The good news is, we can take it with us. We can let those good, wonderful times transfigure us. They can light us up and help us to take on what comes ahead. We can be refreshed. We can know that God enters in and doesn’t go away. Jesus walks back down the mountain with his friends. They are ready to take on what is ahead together. God’s love never goes away, no matter where we are, and we are transformed by it.